According to NACE International, the estimated cost of corrosion in 2016 was as high as 2.5 trillion dollars. In water treatment facilities, roads and bridges, other components of hard infrastructure, the impact of chemical and atmospheric corrosion is expensive and can come on quickly. Keep these vital systems in safe and working order for far longer with polyurea and polyurethane protective coatings from IXS Coatings. As a proud member of the Polyurea Development Association (PDA), we have the solutions you need, from prevention and protection to containment and restoration. Municipal water pipes and tanks are especially prone to corrosion. Wastewater, alkalies, and other hazardous chemicals can cause this crucial equipment to wear out, which greatly increases the risk of drinking water or groundwater contamination. Protect important infrastructure and municipal assets, as well as the environment, with ANSI/NSF 61 potable-water certified, spray-on polyurea coatings from IXS Coatings, a proud member of the American Water Works Association (AWWA). Our solutions are certified for incidental food contact, fungus resistance, and safe walking surfaces. Thanks to the fast-curing properties of these coatings, your facility will experience minimal downtime. Waste Water Containment: Our environmentally safe, non-permeable polyurea coatings have high pH resistance in order to give wastewater pipes and tanks a whole new level of strength. Our experts have the answer to almost any wastewater containment problem. Water Treatment: When it comes to potable water, nothing is more important than safety. At IXS Coatings, our innovative chemical formulations were one of the first to be potable-water-approved by the National Sanitation Foundation (NSF). Not only will our polyurea coatings extend the life of water pipes and tanks, they’ll also keep drinking water free of contaminants. Over time, the ground moves and shifts, taking structural foundations, manholes, sidewalks, and other infrastructure with it. Restore and reinforce the integrity of your civic infrastructure with cost-effective geotechnical solutions from IXS Coatings. 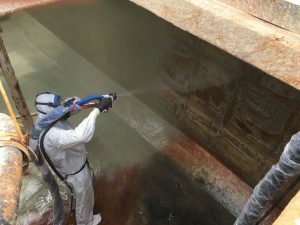 Our fast-curing polyurethane spray foams and polyurea coatings provide robust support for almost any geotechnical problem. If you’re not sure which spray foam or coating is right for you, our experts are standing by to help you find the ideal solution. Manhole Restoration: Hydrogen sulfide in the groundwater can corrode the walls of manholes, breaking down concrete and rendering your manholes suddenly unstable and unsafe. Reinforce your manholes and protect them from future corrosion with long-lasting, elastomeric polyurea coating solutions from IXS Coatings. Our polyurea coatings are easily applied and cure rapidly to minimize cost and ease the flow of traffic. Concrete Rehabilitation: Not only are uneven concrete slabs on roadways and sidewalks costly and time-consuming to repair — they also create a hazard for travelers. Our geotechnical polyurethane foam allows you to raise, stabilize, and support uneven concrete slabs with greater speed and efficiency than traditional mudjacking. Because geotechnical polyurethane foam expands and solidifies in seconds, you can avoid over-spraying and retain better control over the repairs. As a member of the Spray Polyurethane Foam Alliance (SPFA), IXS Coatings offers a full range of durable, high-strength geotechnical polyurethane foam solutions. Corrosion doesn’t just damage the concrete surface of roads and bridges, it also weakens steel support structures, which can lead to cracked, unstable, and unsafe surfaces. 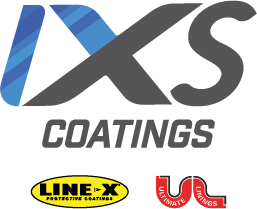 Stop corrosive damage before it begins with seamless, moisture-resistant polyurea protective coating systems from IXS Coatings. With 55 years of experience and hundreds of products, we’ll find the ideal solution for your bridges, roads, and other infrastructure. Concrete Corrosion Prevention: Polyurea coating systems protect your concrete surfaces from the harshest elements, including extreme weather conditions, inorganic bases, acids, alkalis, and abrasion from heavy traffic. With industry leading temperature flexibility and tensile strength, IXS Coatings’ advanced chemical composition provide a long-lasting, elastomeric barrier between your concrete surfaces and the environment. If you need an answer for concrete corrosion, we’ll help you find it. IXS Coatings’ polyurea coatings are proven to prevent corrosion and deterioration, a vital step to upholding the integrity of your bridges and roads. Contact us today to learn about the many ways that our products can help you protect your infrastructure.